Ummm, it's too low to be Mont Royal isn't it? Hmmmmm. Ooooh, I do love a good mystery. Will you ever reveal your whereabouts? I know what city you're in but I'd like try and guess exactly where you are/were. I think I have pin pointed it...Grand View Park just south of GG park looking into the Pacific. Am I close? Oh, sorry John! I shall reveal the location - you are correct! 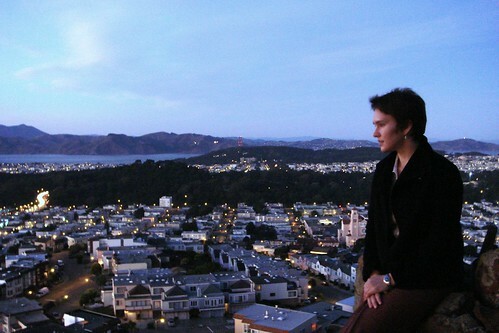 The photo was taken in San Francisco, on a high point in The Grand View Park, looking north-ish. You can barely see the GG bridge head on, kind of in my line of sight. Cool city, I liked it a lot. The bridge was the landmark I was using to determine your location. Is it Golden Gate or the Bay bridge? Well Oakland's coast line isn't very green sooooo....Do I win a prize? Maybe a gold sticker? did you wear a flower in your hair?